Micromax Andro A60 is 2.8 inch touchscreen Dual SIM phone powered by Google Android 2.1 Eclair. The new Micromax Andro A60 has a 2.8-inch resistive full touch screen and a 3.2 megapixel camera at rear. 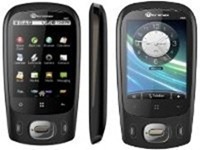 Andro A60 runs on Android 2.1 Eclair and powered with 600MHz microprocessor. The other features include WiFi, GPS, Bluetooth and FM radio. This phone offers internal memory of 150 MB but supports micro SD card upto 32 GB. Camera is 3.2 Megapixel with Auto Focus and digital zoom capturing photos of resolution 2048 x 1536 Pixels. You can also record video but don t expect amazing quality. Andro A60 will also sport Accelerometer and gravity sensor for users to enjoy the light weight Android-platform based games. Supports Dual SIM (GSM + GSM) and 3G ready and promises up to 7.2Mbps speeds via HSUPA and up to 5.76 speeds via HSDPA. I think Micromax Andro A60 will give a tough competition to Samsung Galaxy 5 in same range. Price : Price of Micromax Andro A60 in India is around Rs 8,000.